This article is about the enemy. For the obstacle, see Spike Trap. For other uses for the name, see Spike (disambiguation). Spikes are Koopa enemies that throw spiked balls. They were designed by Hiroyuki Kimura at Nintendo, and they first appeared in Super Mario Bros. 3. Spikes have black Buzzy Beetle-like shells on their backs that are too small for them to enter. Spikes first appeared in Super Mario Bros. 3 as enemies. 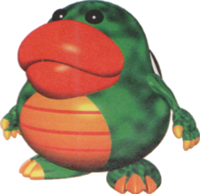 They are found in one Water Land stage and many Ice Land stages, and they attack by pulling spiked balls out of their stomachs and throwing them at Mario or Luigi while wandering around. They can also fall off the edge like green Koopa Troopas. A single stomp defeats them. Despite their appearance, Spikes can be stomped even when they are holding their spiked balls above their heads. Their sprites are shown to not have hair while they are shown with blue hair in their Super Mario Bros. 3 artwork. Spikes can also be defeated by fireballs and hammers. The Water Land King also resembles a Spike while transformed in the NES version. Normal Spikes reappear in New Super Mario Bros. Wii, along with Stone Spikes, a blue variety that uses spiked balls made of stone thrown directly downwards from the ledges on which they stand. This game marks the first appearance of their modern design, which would go on to be re-used in future games. Spikes can be defeated by a simple jump to the head, however, unlike in Super Mario Bros. 3, if the Spike is holding a spiked ball it will damage the player. They can also be defeated by fireballs, barrels, being frozen via the Ice Flower or the Penguin Suit power-ups, and sliding into them as Penguin Mario. In this game, Spikes stay at one spot instead of walking around, although they can turn directions. The green variation appears only in World 2. Unlike regular spiked balls which destroys blocks, the Spike's spiked balls cannot break blocks. Spikes and Stone Spikes also appear in New Super Mario Bros. U, where they act in the same way they did in New Super Mario Bros. Wii. The green variation appears at their own level called Spike's Spouting Sands, where they appear mounted on Flying ? Blocks, while Stone Spikes appear in Dry Desert Mushrooms. The green Spikes jump whenever a "bah" is heard in the music. In Super Mario Momotarō, a Spike is the last creature to join Mario on his mission to rescue Princess Peach. The Spike hopes to get his revenge against Bowser for destroying his home world. During the final battle he helps by knocking Ludwig von Koopa out with an exploding spike ball. After the final battle, he joins Mario in returning the treasure Bowser had stolen to their rightful owners. He is most likely based off of the monkey from the Momotarō. Spikes later reappear in Super Mario World 2: Yoshi's Island. They only are in BLIZZARD!! !, but in the remake, they also appear in Endless World of Yoshis. They are erroneously named "Mace Penguins." Spike appears in Mario Party 10 as a new unlockable playable character. 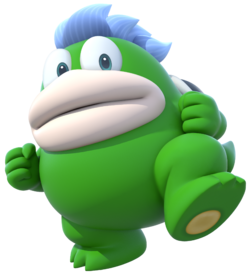 This is the first appearance of Spike as a playable character in the Mario franchise, and also the first game where Spike is not allied with the Koopa Troop. Spike is unlocked by purchasing "Hidden Character 2" in Toad's Room for 600 Mario Party Points, while Toadette is Hidden Character 1. Its voice in this game is the same as in Super Mario 3D World. Spike is also the only playable character in Mario Party 10 to not appear as a playable character in Mario Tennis: Ultra Smash. Spikes appear in Super Mario Party as non-playable characters. They can be found in the background of several different minigames. Although no regular Spikes appear in Paper Mario or Super Paper Mario, Clubbas, a variation of Spikes that use spiked clubs as weapons and are often seen sleeping, appear instead. Characters known as Tubba Blubba and Grubba appear in Paper Mario and Paper Mario: The Thousand-Year Door, respectively. Generic Spikes make their Paper Mario debut in Paper Mario: Sticker Star. 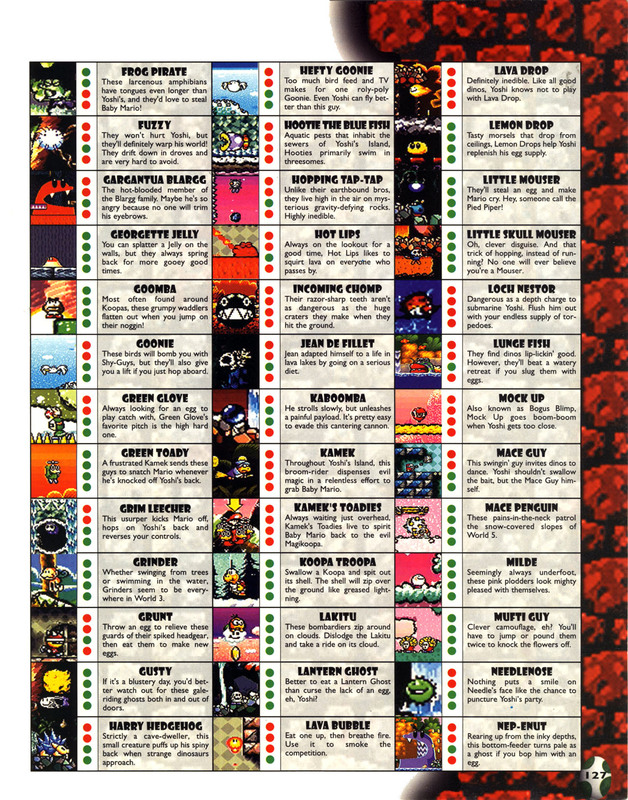 They only appear within the levels of World 2. They also have a lot of HP and they have the same HP yellow Pokeys and Snifits have. 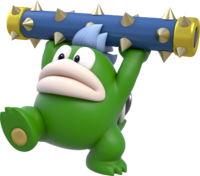 Spikes also fight in groups of two later and are aided by Paragoombas, Paratroopas, Swoops and Hammer Bros. Spikes will chase Mario and throw their spike balls instead of tossing them slightly and letting it roll. In battle, Spikes can hold a spike ball over their heads, making jump attacks ineffective until they throw the ball on their next turn. Spikes can also Ground Pound Mario but if the attack misses, it will bounce to the left. When defeated they occasionally drop a Spike Ball sticker. Snow Spikes from New Super Mario Bros. also appear in this game and sometimes drop a Snowball sticker. If a Spiked ball is touched outside battle from a Spike, Mario loses 2 Heart Points. If a Spike is stunned using the pointer/touch screen as it is preparing to throw an obstacle, the object that has yet to leave its hands will be destroyed. Certain Spikes, such as the ones in Trick Track Hall, cannot be defeated. The red turnips thrown by the 2nd player in the game's Co-op assist mode does not defeat them on the Nintendo Switch version. They can still be defeated using other methods such as spinning or using the Super Pickax. Spikes make their Mario Tennis debut in Mario Tennis: Ultra Smash. Here, they appear in the crowd. Spikes make their second appearance in the Mario Tennis series in Mario Tennis Aces. While they appear as spectators like in Mario Tennis: Ultra Smash, a Spike also appears as a playable character, classified as a Powerful character. This Spike also appeared in the online tournament demo as an unlockable playable character, unlocked after 600 participation points were accumulated. The Sure Shot Challenge (Beginner) level of the Adventure mode pits Mario against Spike in Piranha Plant Forest. If Mario is successful in the challenge, Spike gives Mario the Wooden Racket. Alternate costumes can be unlocked for Spike by earning participation points in the April 2019 online tournament. A blue headband and blue wristband costume is unlocked at 300 points, a pink headband and pink wristband costume is unlocked at 1000 points, and a yellow headband and yellow wristband costume is unlocked at 2000 points. Spikes appear in Mario & Luigi: Superstar Saga + Bowser's Minions, where they are enemies and recruitable allies found in Minion Quest: The Search for Bowser. They are ranged troopers, and attack by throwing Spiked Balls at enemies. Their special skill, Throw the Fight, allows them to throw larger Spiked Balls at enemies, dealing more damage. Spikes reappear in Mario & Luigi: Bowser's Inside Story + Bowser Jr.'s Journey, as enemies and allies in the Bowser Jr.'s Journey mode. They are ranged troopers, and are strong against both variants of Koopa Troopas and Koopa Paratroopas. A Spike Bar in Mario + Rabbids Kingdom Battle. Beep-0 conjectures that whoever had it must have left in a hurry. Spikes do not appear during the events of Mario + Rabbids Kingdom Battle, but there are recurring background elements in Spooky Trails that allude to them, like Spiked Balls and Spike Bars. In addition, one of Luigi's Precision weapons, the Spike Strike, is based on a Spike. Quotes Usual: "My lips are chapped..." ~ "I'm not big—my shell's just small!" ~ "Dodge this!" ~ "SPIKE, SPIKE, SPIKE!" While holding spiked ball: "This is going to hurt!" ~ "Catch!" Ludwig battle: "YESSIR!" ~ "Bomb squad reporting for battle!" ~ "It's my big moment..." ~ "I wasn't ready for this..." ~ "Remember your training..." ~ "The Ludship... It's...glorious!" Level 18 Notice: Stats in parentheses are from the game's Easy Mode. Minion Quest: The Search for Bowser bio: They spit up and throw Spike Balls at foes. Gross! The larger ones they throw are especially strong. Bowser Jr.'s Journey bio: They spit up and throw Spike Balls at foes. They seem to find the shells of Koopa Troopas and Koopa Paratroopas to be easy targets. A big Koopa with a tiny shell. "Spikes use their immense strength to hurl spiked rollers that are even bigger than they are!" Notebook bio: "This hardworking turtle has a very small shell. It spits out metal balls that it'll throw at its enemies." For this subject's image gallery, see Gallery:Spike. Spike's Super Mario Bros. 3 sprite depicts it as nearly bald, with only two pixels allocated for hair, and its Yoshi's Story appearance depicts it completely hairless. This page was last edited on April 14, 2019, at 11:25.